Every person alive has the same twenty four hours in a day. 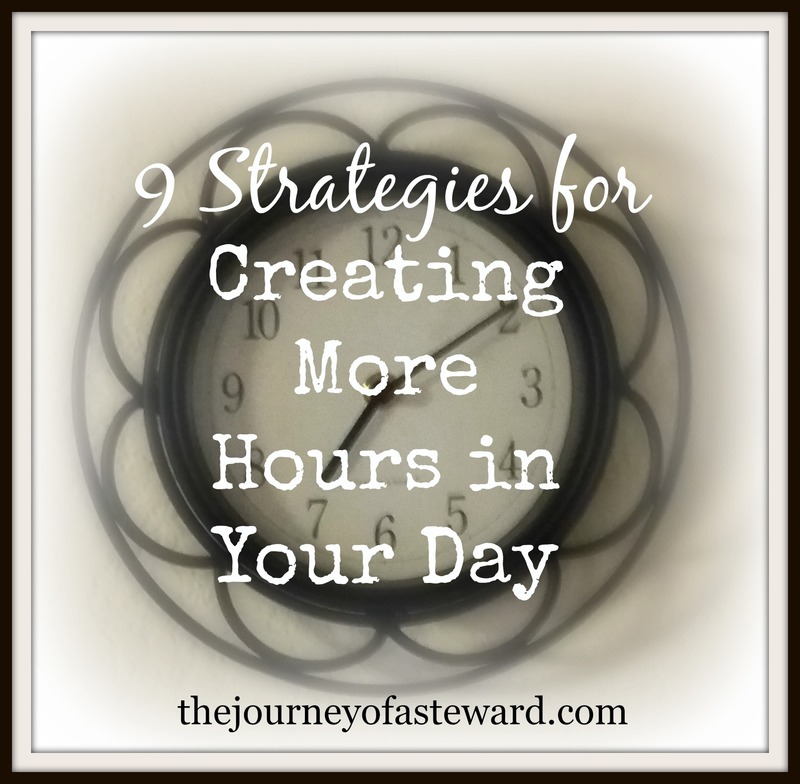 Do you wish you could create more hours in your day? How is it that some people just seem to get more done than others? As a busy mom, sometimes when my head hits the pillow I just wonder why I did not get everything done I needed to get done. What I have found through all the classes, all the books, and all the trial and error is there are specific strategies to create more hours in your day. Here are 9 strategies to create more hours in your day and learn effective steps to better manage your time. Seek– …ye first the kingdom of God, and his righteousness; and all these things shall be added unto you.” Matthew 6:33. Give every day to God. Ask Him for wisdom and guidance for the day ahead. He is the source of your time. He will multiply your resources. Systems– Creating systems is a must, but a system is worthless if you do not implement the systems. Systems take a little time to get used to. You cannot expect to create a system in your life then put it into practice and it just works from here on out. You must take the time to work the system, tweak the system to the needs of your family, and master the system. Schedules– Setting up schedules sometimes can be difficult especially with little ones or lots of ones. 🙂 Your schedules do not need to be strict. They need to be used as a guideline to direct your day. We do not live and die by the schedule or I would be crazy. I have always been a fly- by-the-seat of the pants kind of girl, so our schedules are fairly loose. As the children, have grown up they have become a little tighter. Structure– All people need structure. These are the routines in our lives. “By much slothfulness the building decayeth; and through idleness of the hands the house droppeth through.” (Ecclesiastes 10:18) Our days should not just be a free for all for everyone. This includes young children. They need structure and continuity in their days. Stream-line– This concept has probably made the biggest difference in my days. When you are going about your day, think how certain things can be stream-lined or made easier. This includes stacking. I rarely go to the store for one item. I rarely stop at one store. Everything in stacked. If I have to make a run to the store, I wait until I have to go other places like the bank or the post office, etc. If I have to be in the kitchen to prepare dinner, I am unloading the dishes while I am waiting for the water to boil. Get the picture. I use every minute to my advantage. Sleep– Don’t laugh! I know what you are thinking. I have no time to sleep. There is too much to get done. It is proven scientifically you have more efficiency and effectiveness when you are well rested. Your body does all of it’s re-cooperating and recovering while you sleep. Your brain downloads and your organs detox. Do not deprive yourself of sleep. Strive for Sloppy Success– This is really convicting to me. Perfection breeds procrastination. Do not look for or expect perfection or you will never do it. Celebrate the sloppy successes. The goal is to move forward and not be stagnant. Two things can happen when we expect perfection. You will wear yourself out trying to make everything perfect or you will not do anything. Perfection paralyzes either through exhaustion or procrastination. Start!– Ready, Set, GO! There is no better time that now. Start with baby steps. Implement one thing at a time. But start! Our days belong to God, we are merely a steward of the time He has given to use. What are you doing with your time? 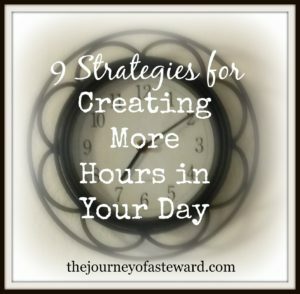 My hope is these 9 strategies to create more hours in your day will help you on your journey as a steward! Just wanted you to know we featured this post on this week’s Weekend Wind-Down link party! Congrats, and thanks for the great content! Love these. I think what spoke to me the most is the celebration of sloppy success. I never even thought about it that way, but it’s so true what you say–you can’t strive for perfection! Thanks so much for sharing such a useful post on #shinebloghop this week! So happy you could join us! These were all awesome. I really like sleep and structure.